You can do some things to relieve tennis or golfer's elbow. When the pain first starts, using ice against your elbow can help to make it more comfortable. 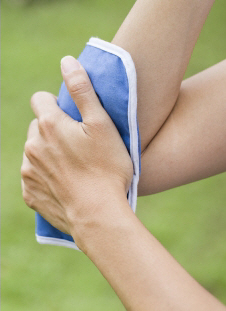 Put crushed ice in a damp towel and hold it against your elbow for 20 minutes. If you have sensitive skin, smear it with oil before applying the ice pack. Simple pain relievers can also help. Paracetamol can work well and is safe, as long as you take it according to the instructions. Non-steroidal anti-inflammatory medicines (also called NSAIDs), such as ibuprofen, diclofenac, and naproxen can help, but you shouldn't take them for more than a few days without talking to your doctor. Do not take NSAIDs if you have kidney, heart, or stomach problems. Non-steroidal creams are safer and can help when you rub them onto the painful area. Talk to your pharmacist. Smoking can slow down healing and recovery, so if you are a smoker try to quit. If you think that something you do at work is causing your pain, talk to your manager about changing how you work, or even changing your role. If a repetitive movement at work has caused the pain, your injury might be covered by ACC and you might get help with the cost of treatment and time away from work. Talk to your GP or ACC about this. Sometimes tennis and golfer's elbow can get better simply by changing the way you do things and using pain relief. But if it is very painful right from the start, it is likely you will need further treatment. Your physiotherapist can help with massage, strengthening exercises, and stretches, which can all help to treat tennis or golfer's elbow. Special braces that limit the amount your elbow can move, and which also reduce irritation, can help. Your physiotherapist may suggest you use a brace. If your elbow isn't getting better after six weeks of treatment, your doctor or physiotherapist might recommend you have a steroid injection. Steroid injections help to reduce pain in the short term, but they don't stop it coming back. Also, research shows that people who have steroid injections might not do as well in the long-term as those who have just had physiotherapy. If you do have a steroid injection you should make sure you also continue with physiotherapy. Having more than three steroid injections is not recommended. Talk to your doctor about what is right for you. Some specialists use new therapies that help healing by creating controlled inflammation around the injured area. These therapies seem to work quite well in the short term, but because they are new we don't know how well they work over the long term. Almost all cases of tennis and golfer's elbow can be treated without surgery. However, if your pain hasn't got better after six months, or if it is very bad, your GP or physiotherapist might refer you to a specialist. On the next page: What happens next?